« Growing Fruit Trees in Ghana: advice please? A few years ago, I acquired a small fragment of orchard, now a suburban garden, which included an old pear tree of medium height growing in lawn with clumps of bluebells and wild flowers beneath. The tree turned out to be the common variety Williams’ Bon Chrétien, and to my dismay, it suffered total crop failure from an infestation of pear midge (Contarinia pyrivora). Thus began an annual battle which may be instructive or at least amuse. The books indicate that the female midge deposits her eggs in the blossom bud or balloon when it is just opening and the rapidly developing larvae cause the fruitlets to swell, distort, turn black and fall to the ground. The larvae pupate about 5 cms underground and the next generation midges emerge the next spring. The classic advice is to pick and burn all the affected fruit and also cultivate the ground and spray with carbaryl or gamma-HCH which I was reluctant to do. Determined to find a non chemical solution, I lowered the height of the tree, which enabled me to pick every single fruitlet, hoping to break the cycle. Next year the fruitlets were still virtually all affected and were totally picked again. Over subsequent years various attempts were made to use a barrier sheeting under the tree coupled with fruitlet picking and even fly papers and ultra violet lights but to little avail, although a few pears did mature. I also discovered that some larvae drop to the ground before the affected fruitlet does, so early removal of affected fruitlets is required. It seemed possible that midges were arriving from other nearby gardens. It also appears that Williams’ is very attractive to pear midge so the tree is being partially top grafted over to Comice. Close observation of the emerging midges at blossom time, they are quite large, like eighth-size crane flies, showed that they emerged just before sunset and formed small mating swarms often in the same airspace between the blossom and the setting sun. They dance from 2 to 5 metres above ground level and can be easily seen against a clear sky. Finding that water jets were ineffective, in desperation I fitted a long PVC bathroom waste pipe to the vacuum cleaner nozzle and found to my astonishment that midge clouds could be very effectively hoovered out of the sky! This continued for several evenings as new midges emerged. Clearly this approach is very time consuming, small-scale and slightly eccentric but it is pleasant to be out with the blossom at sunset whilst knowing the method has zero impact on other pollinating insects. The improvement in fruit yield was dramatic and I now have so many sound fruit that I am able to thin the crop in line with normal practice. Using garlic spray against scab and feeding the tree has completed the restoration of an attractive and now productive garden pear tree. An excellent story Peter. Thank you for sharing this. My pear tree deserves more attention. It is good to know how you overcame the pear midge. It is so disappointing to see much of the crop being lost. Like you, I won’t treat my tree with toxins, that kind of fruit is for sale in supermarkets. I have cultivated the soil beneath my wall-trained tree, so reducing the pear midge problem, but sadly the surface root disturbance has allowed winter storms to tilt the tree over. Plenty of blossom right now though on 31 March in Edinburgh. Pear midge has been the bane of my life for many years. Some years ago I sprayed annually with chemicals that are no longer available and they certainly worked, but how much collateral damage they did I do not know. I have to say that I did not notice the bee population crashing. When I only had two pear trees I covered the ground under the trees with polythene to stop them hatching out in spring, but this did not work. The two varieties were Williams’ and Conference and it was noticeable that if the Williams’ blossom was damaged by frost then they attacked the later flowering Conference. Most years it was the Williams that was decimated and the Conference was left alone. For the last four years I have been picking off the infected fruit. This takes experience because the fruitlets require picking off before they turn black. If they are black, the tenants have gone. So infected fruit needs to be identified earlier. 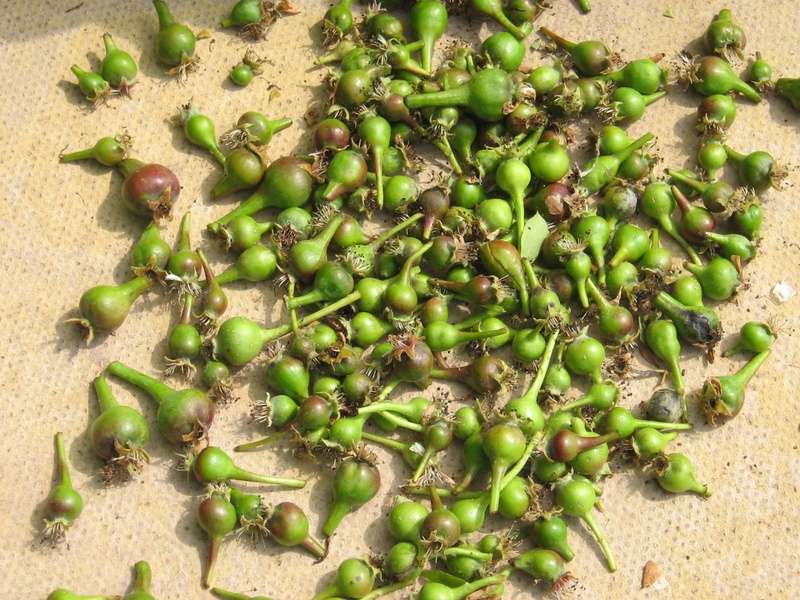 Infected fruitlets can be very much larger, orb shaped or cylindrical, but tail end fruit set generally have small to very small infected fruitlets. I have to say I have made no headway with controlling pear midge by picking off the fruitlets. Last year I decided to bring my new super-duper fruit picking steps along to inspect the very tops of the trees. This revealed something startling – all the fruitlets at the top were infected, The tops of the trees would seem to be more efficiently covered by the ovipositing females. In previous years the tops could not be reached nor could the infected fruitlets be seen from down below. It will be interesting to see if this extra diligence pays off this year. Needless to say infected fruitlets require burning, I have counted around thirty larvae in some fruitlets. My final question is – are perry pears attacked? Does anyone know? I have a Jargonelle pear that was decimated by pear midge last year. There was a small infestation in the previous year but I had no idea how much damage could be done and took no preventative action. I also have a young Black Worcester (perry or cooker) and this has been infested too. I planted other pears before I realised there was a midge problem. These are yet to crop. All my pears were chosen for the same pollination time so I guess if one gets infested they all will. I’m intending to spray with deltamethrin at the white bud stage to target the period when the midges lay their eggs and before pollination. I hope this will have a low impact on beneficial insects. This is definitely a case for me too, me too. My Packham’s has been / is decimated by pear midge. For the last three years I have picked off infected fruitlets, occasionally cutting one in half to check it had miggleys inside. No need to burn, just keep a bucket half full of water under the tree and flick the infected fruit into it. Better this year, but is that due to cold weather? Next year I will inspect on warm evenings at green cluster and see if I can do the Hoover trick! The deltamethrin spray may have done the trick for me. My Jargonelle has a good crop of fruitlets and I haven’t detected ant infested ones (yet). I found it quite difficult to judge the right time to spray particularly as the flowering was delayed this year. I ended up spraying twice with a two week interval. The second treatment was probably at the right time during the white bud stage. As this is a systemic insecticide it has probably had an effect on the hatching larvae trying to enter the fruitlets as well as on the midges laying the eggs. Good pollination results suggest that the timing of the spray wasn’t too late and avoided harming bees. I sincerely hope this is the case. I was very careful to follow the advice on this. If this site wasn’t well moderated there would be some exceedingly immoderate language here. Packhams pear crop = nil, midge = total victory. Tried to hoover but couldn’t spot them to do so, and the very open winter obviously suited the midge down to the ground. Has anyone tried deterrent sprays such as citronella? Need to look up my aromatherapy books! I suspect I would have to spray daily mid-afternoon from grape cluster to half open, about a fortnight with my trees. Just found this interesting article on pear midge while browsing. I have copied the same process with my Williams’ pear I inherited on moving house 10 years ago. Initially I reduced the overgrown mature tree with a chainsaw from about 35 foot to 8 foot and also removed all blossom. Pear midge was back two years later so I removed all infected fruit. It was back again the following year, I sprayed the following spring at white bud stage followed by removal of all infected fruit. No luck, it was back again and now infecting the newly planted 5 year old Conference and Comice next to it. In desperation in the autumn I covered the ground underneath the Williams’ with weed control fabric then covered it with grass clippings and compost and left it in situ for a year; they were back the year after. Last year and again this year after flowering I stripped all tiny developing pear fruitlets off the Williams’ and sprayed the Comice, Conference and Beth pears with Pyrethrum 5EC. While summer pruning the vigorous new growth on the Williams’ pear at the end of July I discovered two well developed clean scab free pears in the heavy canopy under the tree I had missed. One treatment I learned about from a chap in West Lancashire, where I used to live, was a substitute for the no longer available Winter Wash. This is to spray the dormant fruit trees in December/January with Jeyes Fluid, which acts as follow up to October Bordeaux spray and cleans/disinfects trees. Thirty years of pear growing, Doyenné du Comice, Williams’Bon-Chrétien and Conference, all come to naught after 8 years of pear midge destruction. Spraying, 10cm soil cultivation, black polythene for months, destruction of all fruitlets, nothing has worked to break the cycle. So I have had to resort to the chainsaw, in the hope that a 5 year hiatus before replanting will resolve the problem. I used to get a huge crop from all three varieties, but for the last three years not one pear survived to picking. Here’s hoping that it is not a result of climate change and no really deep wiinter frosting to destroy the pupae. A follow up to my previous postings: I have continued to use deltamethrin at the white bud stage on my Jargonelle and I have had total success. Now it is the birds and wasps that take most of the pears. My Black Worcester (culinary) is cropping well and doesn’t seem to need the same degree of protection against pear midge (or the birds and wasps either). The pears remain on the tree until late November and cook beautifully. I didn’t like cooked pears until I ate these. Ooo er. Are you sure you want to ‘clean and disinfect’ your trees of ALL the insects? Quite a few of the ones overwintering in the bark do enjoy munching on the various caterpillars and aphids. And a good growth of lichen does no harm at all, merely indicates that you live in nice clean air. Re: Pear midge. I have a cracking crop of Packham’ Triomph this year, but sadly I don’t think my actions have much to do with it. There were several very cold nights quite late in spring, which mean I have no Suntan or Greengages or Bramleys, but plenty of apricots and Discovery – work that one out! I strongly suspect it was the cold nights, not my regular picking-off-and-destroying that suppressed the pear midge. I wandered around the ‘orchard’ (all six trees) on several evenings during/just before pear blossom time but never spotted hatching midge so couldn’t try the hoover trick. However, NEXT year, when there should be little midge, I shall citronella spray every evening from grape to white bud. Good luck to everyone else fighting the wildlife for a portion of the harvest!